If you don’t have time on your hands, now is your opportunity to change that. 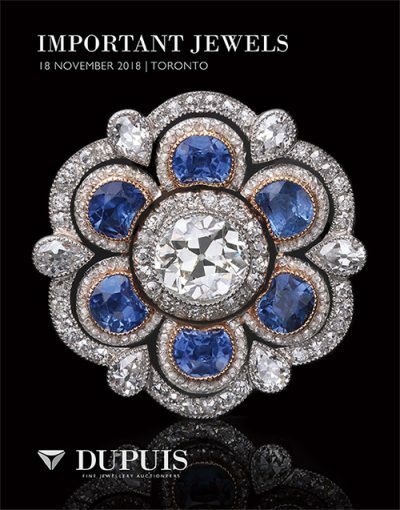 This November, the Dupuis Important Jewels Auction features a wide-ranging assortment of fine timepieces. Are you looking for the perfect accessory to complement your ensemble at the gala? Does your future include a prestige timepiece you can rely on to keep you punctual in the most stylish way? It’s all here. Rolex timepieces are famously reliable and prestigious. With 8 Rolex watches offered in this auction, you’ll find a model to meet your needs, whether it’s one from the 1950s or a contemporary GMT Master II. If you need a yellow gold, white gold, or a steel and gold model, it’s here. Will leather strap suit your needs, or perhaps diamond accents? One distinctive model features diamonds and rubies. Perhaps you’ll be the lucky bidder on one of these. If Cartier is on your wish list, do the names, Panthere, Santos, Pasha, La Dona, Tank Chinoise make your heart go tick-tock? Put your hand up at the auction for one of these important Cartier timepieces. Style is central in this auction. There is a Patek Philippe Ellipse timepiece. Patek Philippe, a brand famous for its precision and spot-on for classic style. This is a timepiece from a brand of unparalleled renown. A very stylish square wristwatch with diamonds, and branded by famed London Jeweller Kutchinsky is a lovely statement piece. The movement is by another highly regarded house, Chopard. A covered bracelet watch and a wide cuff two-time-zone bracelet are perfect jewellery complements to consider for your jewel wardrobe. There is also a rare stainless steel ‘Speedmaster’ Chronograph Wristwatch by Omega, circa 1961. LOT 178 A LADY'S DIAMOND AND GOLD 'TESORO' WRISTWATCH, TIFFANY & CO. These timepieces are available for preview online now, or in-person from November 5th, for the Important Jewels Auction November 18th.